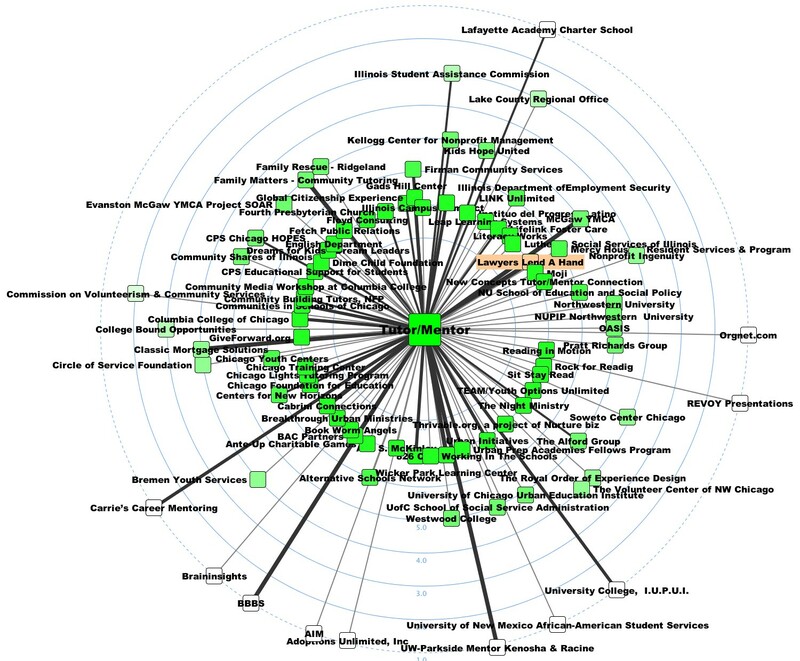 The above map shows the organizations that attended the May 09 T/MC conference. This conference drew 85 organizations and 130 attendees from Chicago and other regions. The organizations that are closer to T/MC on the basis of zip code are in a darker shade of red, but as we move further away from T/MC the shades become lighter and lighter. 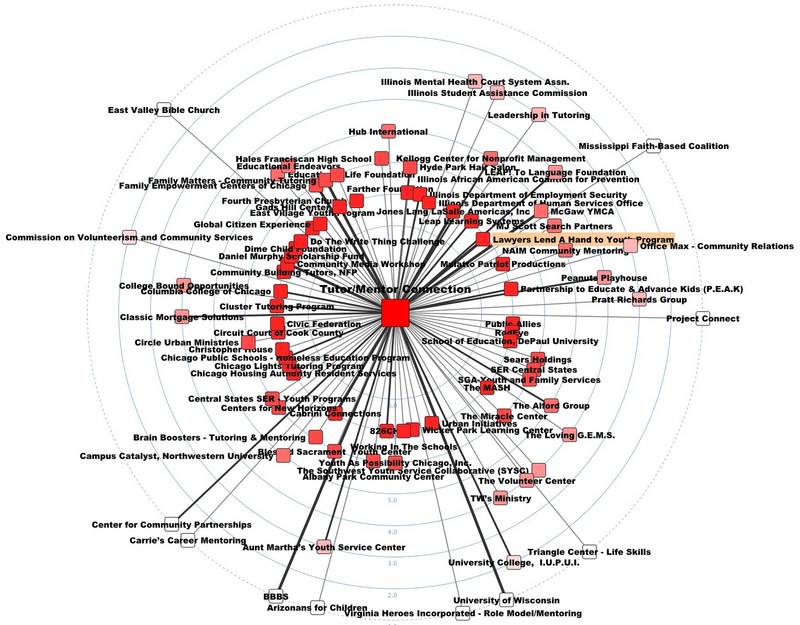 The donor is highlighted in yellow in the map. Karina Ayala-Bermejo, Executive Director, Sun Times Judge Marovitz, Lawyers Lend-A-Hand to Youth Program, was the donor for May 09 conference.. Again, the thickness of the connecting links between T/MC and other organizations is directly related to the number of conferences the organization has attended. 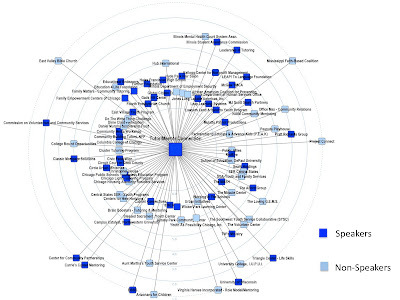 The organization that has attended maximum number of conferences since May 08 to May 09 has the thickest connection link to T/MC. 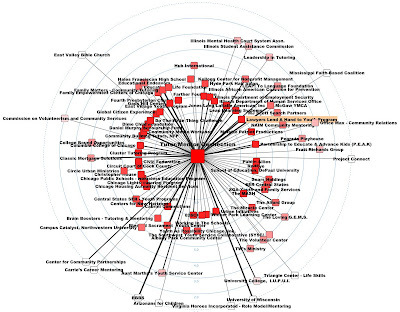 Similarly, this map shows the organizations that attended the Nov 09 T/MC conference. This conference drew 90 organizations and 150 attendees from Chicago and other regions. T/MC received funds from the same donor (Lawyers Lend-A-Hand to Youth Program) in Nov 09 conference also and the donor is highlighted in yellow in the map. 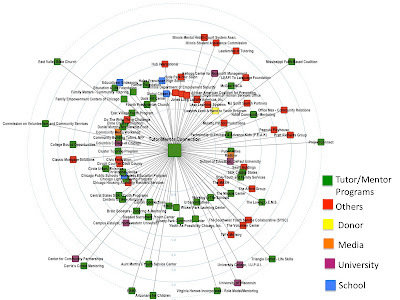 As the thickness of the links is directly proportional to the conference attended, the organization that has attended maximum number of conferences from May 08 to Nov 09 has the thickest connection link to T/MC. 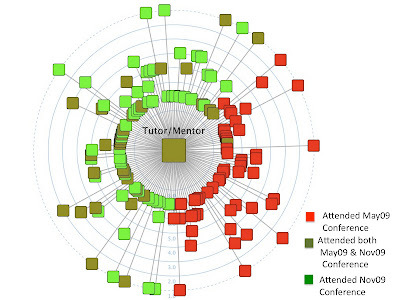 In the above two maps we have shown the number of speakers and non-speakers that participated in May 09 and Nov 09 conference. The speakers are shown in dark blue and non-speakers are in light blue. In May 09 conferences there were about 60 speakers from different regional and local organizations, where as in Nov 09 conference there were approximately 35 speakers. 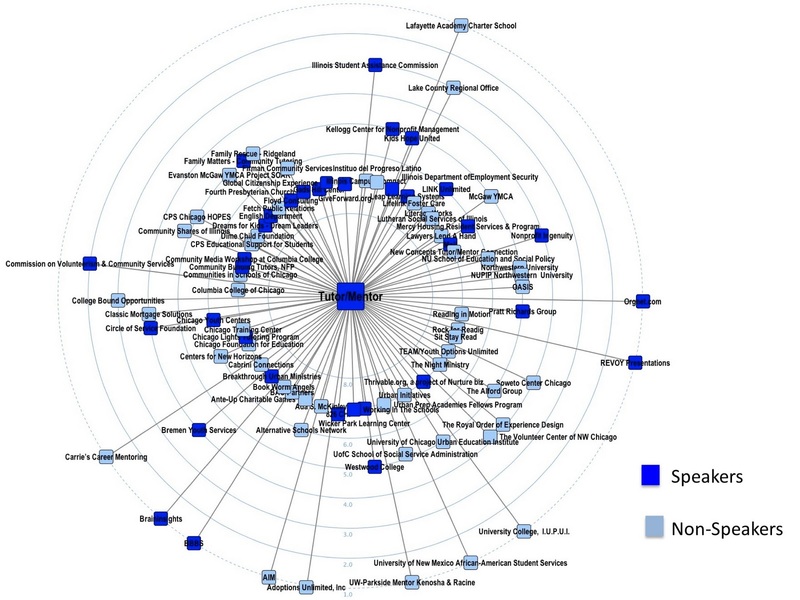 The above two maps represents a nice distribution of organizations that attended the May 09 and Nov 09 conferences based on different programs. 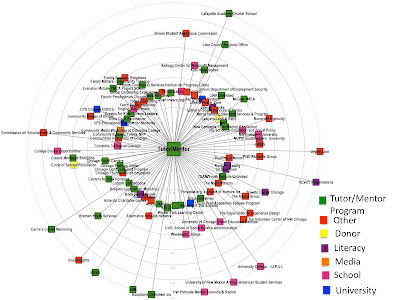 The map has been color-coded to represent tutor/mentor programs, programs supporting tutor/mentor programs, donors, schools, universities, literacy and media. 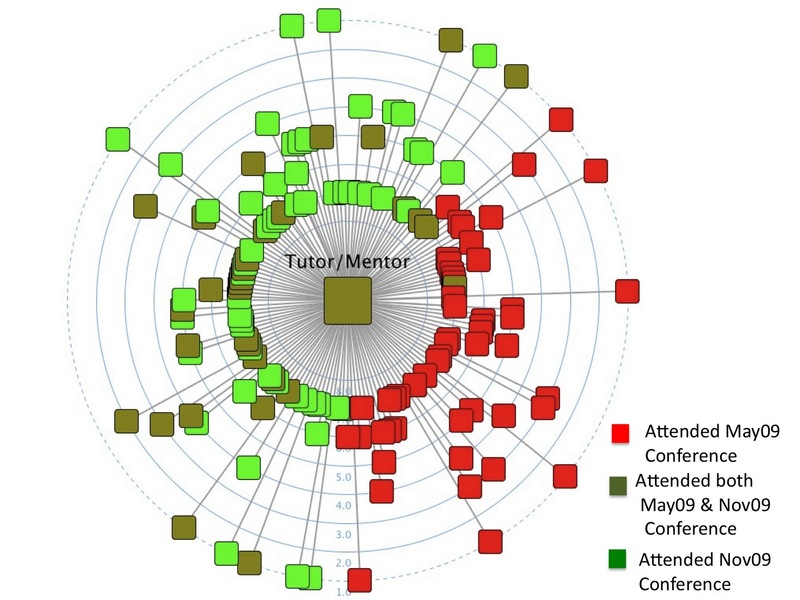 The above map shows a combination of May 09 and Nov 09 conference. 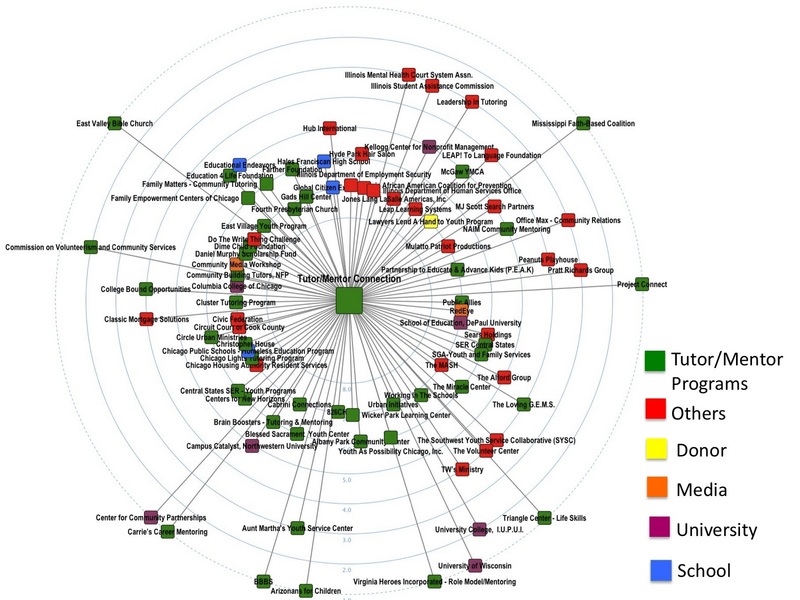 In this map the organizations are divided into three categories: 1) attended May 09 conference 2) attended Nov 09 conference and 3) attended both May 09 & Nov 09 conference. 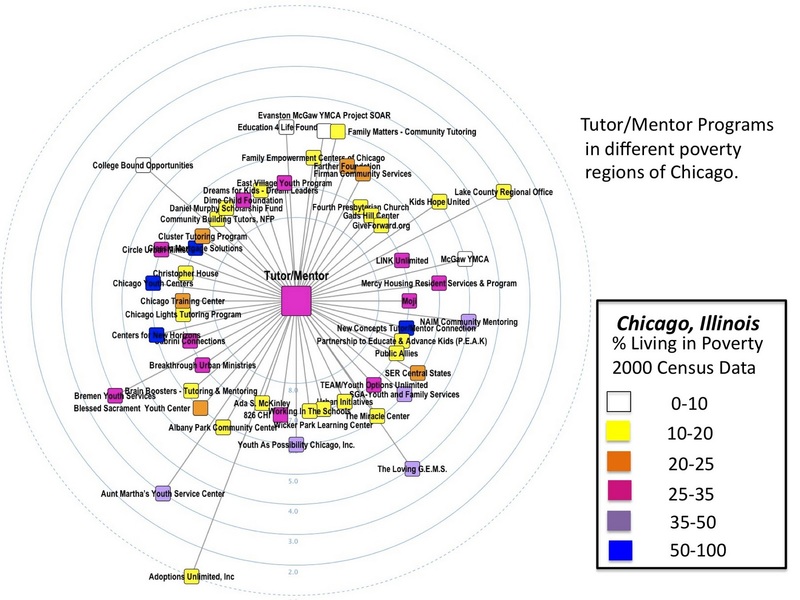 Finally I have used an interactive map of T/MC program locator and a SNA map to show the number of tutor/mentor programs present in different poverty regions of Chicago based on the 2000 Census data for % living in poverty in Chicago, IL. 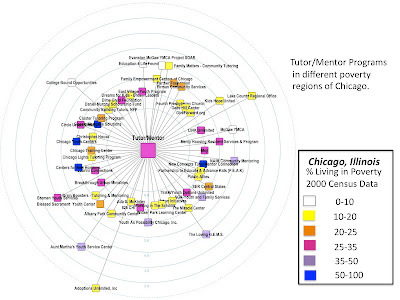 The interactive map shows the number of tutor/mentor programs present within different areas of Chicago based on their zip codes, and those areas are color-coded based on the percentage of poverty in that area. 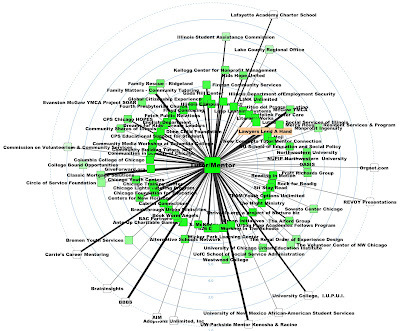 The SNA map shows the conference attendees from different tutor/mentor programs for the May09 and Nov 09 conference. 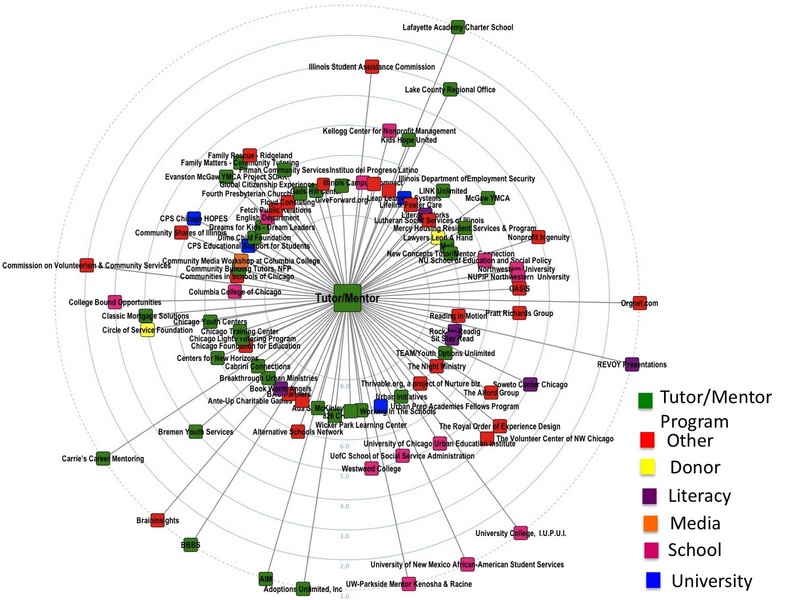 The tutor/mentor programs are color-coded on the basis of the poverty in that zip code. The map shows that attendees in the May09 and Nov 09 are from wide spectrum of poverty regions. These conferences help participants from high poverty zip codes to learn from each other, and build relationships that help them constantly improve their own programs. As people from different zip codes come to these conferences, they can borrow ideas from these conferences and implement it in their own respective zip codes. 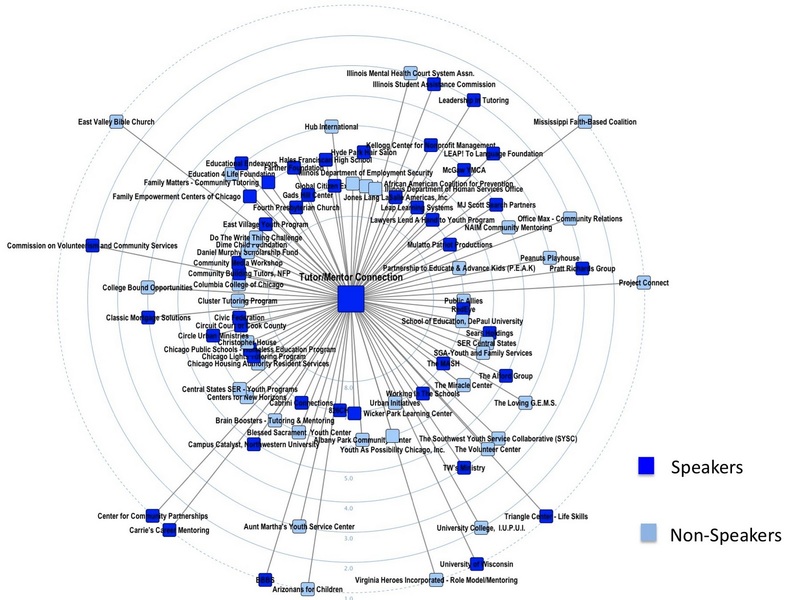 These maps are really good and they demonstrate the range of people coming to the conferences in Chicago, as well as the potential of using SNA to demonstrate the impact of the T/MC. 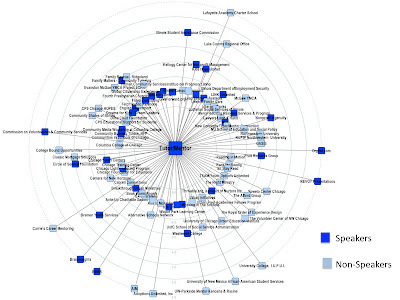 Now that maps of the 2008 and 2009 conferences have been created, please help us find donors who will provide financial support for the conferences, the T/MC, the SNA project and the GIS mapping project. If you want to drive traffic to your site, then you need to know all the most popular social networking sites out there. Most of them, which you use, the more people you are going to be able to achieve. But we want to make sure you use these sites properly, because if you do, you'll see a huge growth in business. buy targeted facebook likes-Buy our special customized package of targeted facebook likes by real users of USA. 100% natural likes from USA for your facebook business page are available at affordable price. Your post give me some good ideas, it's really amazing. Keep it up! totally agree with you. The author made it really easy to absorb the information and understand it. Thanks! Find the best singapore company incorporation if you are going to register business!